Free bibliography and title pages. This review has not yet been approved by the owner of this writing service. If you are the webmaster of Custom-essay.net, please Contact Us to approve or remove this review. The website is minimalistic and probably somewhat incomplete – there are some defects in design, some fragments of texts are not seen (for example, in price-list). There is very little information about the service, it seems that the people behind the site weren’t exactly sure what they are supposed to write about themselves. Prices are low – even the highest, which are supposed to cover the fees of Master and PhD level writers, don’t rise higher than $49.5 per page, which looks inadequately cheap. 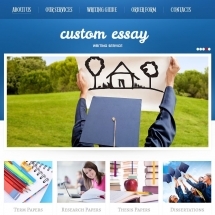 The lowest price is $11.55 per page, for High School assignments due in two weeks – it feels mostly right, but I can’t help but think that the same people write all their assignments, irrespectively of their presupposed academic level. Customer support is better left unmentioned at all. It is available via chat and e-mail. E-mails are generally left unanswered. Chat operators usually appear right away, but are extremely arbitrary in their behavior – some questions they simply ignore, some they answer in a very vague manner. Sometimes they simply leave the conversation almost mid-sentence and never appear again, without any explanations or at least apologies. There are no samples on the site, which means no way to evaluate the quality without actually ordering something, and after dealing with all the other features of this service one isn’t very enthusiastic about it. No direct contact with the writer – you only can contact the support operators, who will in turn forward all your messages to the writer. Judging by how they work, it can hardly be called a very trustworthy method of communication. Unprofessionalism is everywhere you look – the site contains almost no useful information and is poorly designed. It is obvious that its creators have probably seen some other writing services and tried to copy parts from them, but didn’t put a lot of effort in it. Functionality leaves much to be desired – you cannot talk to you writer, only send your messages through the customer support, which is extremely erratic and undependable. The service provides no refunds under any circumstances, instead boasting of doing any number of revisions. But if the writer is incompetent to begin with and there is no possibility to get my money back in case it is really so, what good will revisions done by the same incompetent writer do me? Speaking about prices – they are uncomfortably low. That is, High School assignments are priced alright, but higher academic levels cost negligibly more, which may only mean that more or less the same people do all of them.